Choose an NPC to take on an exciting underwater adventure! We can leave as soon as their order is complete! 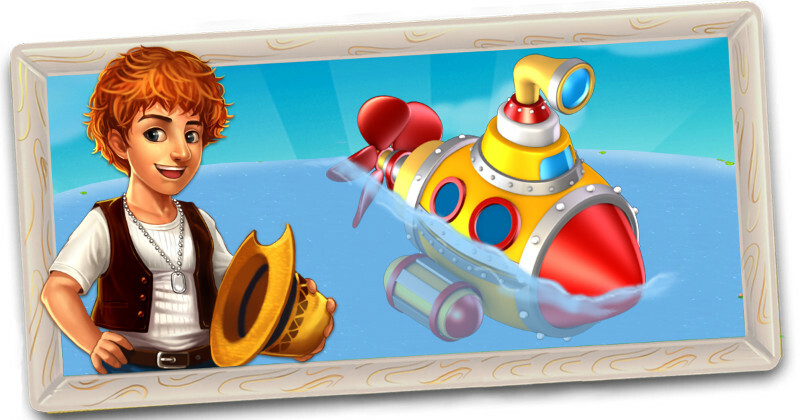 Darryl (Felicia,William) just leveled up in the Submarine Adventure! Collect all kinds of treasures found in the adventure. Hey neighbor! 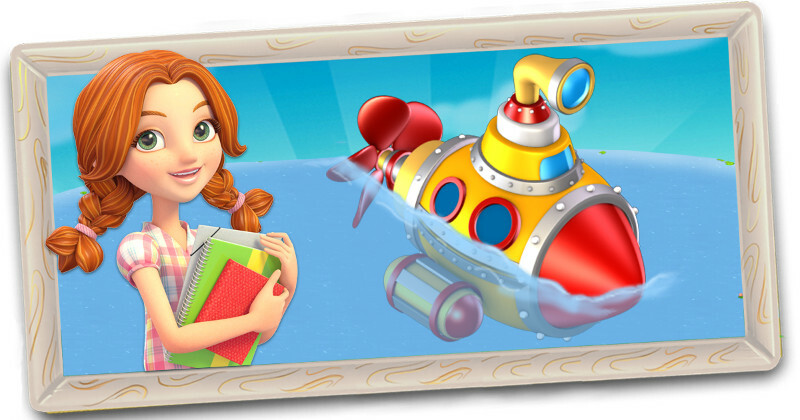 I just came back from a Submarine Adventure with you. Here’s 1 Organic Fertilizer for joining me. Thanks for the trip! Dot’t forget to thank your partner! 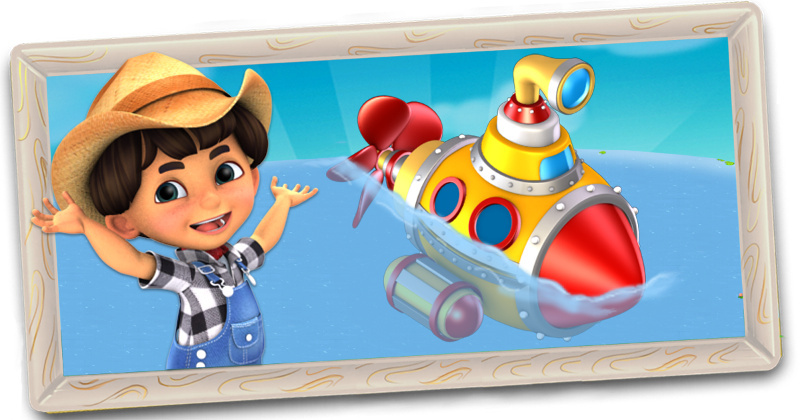 A Submarine Adventure is always better with a friend! Also what are these things next to the mission here in Justysia like Summer penguin and Purple voucher and etc? What are Ingredient Boxes??? They are at the right where there is a red arrow. When you put your mouse over the red arrow it says ...s Ingredient box. What does that give? Greylace, Thanks for pointing out that the message bottles now have one green voucher each. I have a pile I had not opened, so a nice source of green vouchers. So far, I only received one message bottle from Darryl. It had a riddle (Something like "What did one shore say to the other? Show me your mussels."). It also had one green voucher. I have 13 of the various submarine message bottles. They do not seem worth the time to open them. It would be better if they just gave a random water ranch product. Yes I know that this site does not have any say in what actually happens on the game. Only had one bottle so far, but seems to be a total dud, opening gave a "poem" to read and that was it. The animation took several times longer than reading that. Hope Im wrong and it has a use. what is the bottle? How we use it? Does anyone understand what the partial green, red, and yellow circles that partially encircle Darryl, Felicia, and William and also the material and surprise boxes represents? I had guessed probability but who knows, they change mission to mission? For what it is worth I got two no gift results from William in a row and then an ironwork1 from Felicia. one confusion plz..after returning from adventure they give us coins..exp...gift box...do they give same things to adventure partner or not??????? What happens when the submarine needs to be repaired. Guess we need RC to fix it? And I still do not know what the meaning of friend is, anyone? What Louise said is correct. I am on my 3rd William mission and the requirements are ramping slower than this chart. It was still just a crop, I think wild rice. Seems like you pick Darryl, Felicia, or William to determine the type of mission, what it requires, how long, what the odds of different results are. Then you also pick the team mate, and I and my friend have not teased out what if any good that is doing us. Thanks Sunflower. That information is useful. Do you know if it makes any difference who you choose? (Daryl or Felicia etc) or if it matters if you choose a team mate as well? For what it is worth, I have gotten fertilizer, yellow tickets, or nothing for the 12 hour mission. For the 24 hour mission I have gotten a 3RC part for the grove, a decoration, or fertilizer. I still do not know what you are sending your friend when you designate them. So the longer missions, only available at the higher water ranch levels, do yield better gifts. Any idea on when this mission will be available Family Farm?